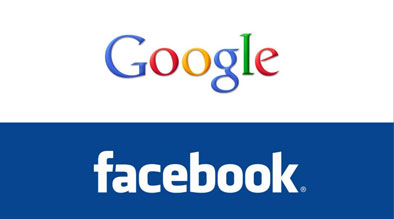 In late 2010, Facebook surpassed Google in terms of visits and users. Advertising on Facebook is now essential in order to reach a very wide audience. More than half of Americans are on Facebook. As a marketer, it is a great platform for paid search. 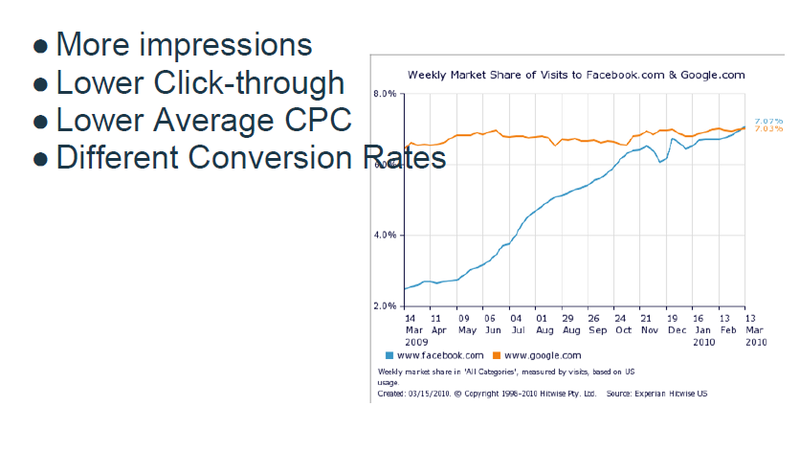 Facebook paid ads have more impressions, lower CTRs (average is .1%), lower average CPC (1/4 cost of Google CPCs) and different conversation rates since most clients are using Facebook for branding and using cost per engagement as a metric. Facebook is often an early influence tool. Consumers exposed to brands on social media are 50% more likely to click on paid ads. Always start with your fans/friends when you begin targeting folks on Facebook: These users are most likely to buy from you. Expand ads to target the fans of related brands: Target other brands that are liked by your target audience in age and demographics, income, geolocation, and gender. Use keyword stemming to find interests that are available: This technique is similar to using the suggest tool. Start typing “Vacation” and then start typing different letters of the alphabet starting with “a” and then “b” etc. to see the suggestions. Test Images before Copy: Use contrasting colors to draw attention to your ads. (Facebook has blue all over so use bright red and yellow for example). Also link images to audience to increase relevance. Also, using human faces has been proven to do better than using body images or other images. Rotate ads: Finely targeted users who spends 4 hours per week on Facebook will begin to experience ad fatigue when exposed to the same ad repeatedly. Eventually, this leads to ad blindness and your CTR will go down. When CTR decreases, Facebook will stop showing your ads. To counteract this, rotate your ads every 2-3 days or as impressions drop. This helps increase CTR and maintain impression volume and lower Cost per like. Maintain the Facebook experience on your website: Add videos and photos on your website if you are drawing people from Facebook by putting a URL in your paid ad. This will help you maintain engagement and reduce bounce rates. Try to understand that you are drawing traffic from a very engaging site, so your site needs to be engaging as well. Facebook is a powerful tool for which a marketer can reach a wide audience. By maintaining freshness, preventing ad fatigue, focusing on photos, along with the rest of the best practices listed above, you can achieve great success on Facebook paid search.